Why Springload in the First Place? For anyone playing extrusion hot-potato in a multi-person build a-la Lasersaur, springloaded T-Nuts are a wonderful convenience. When springloaded, these otherwise normal T-nuts stick in place rather than slide down the slot, making the building process more manageable with less parts to track simultaneously. We just set and forget! Don’t get me wrong. Springloaded T-nuts already exist for us hobbyists using maker-style extrusions. But they’re pricey, as in more-than-a-dollar-a-pop pricey. Alternatively, we have the more popular “afterthought nuts,” commonly known as “Drop-In” style T-nuts. We can conveniently add these nuts even after we’ve closed off access to the slides with other nuts. But anyone who’s done that a few dozen times knows two things. 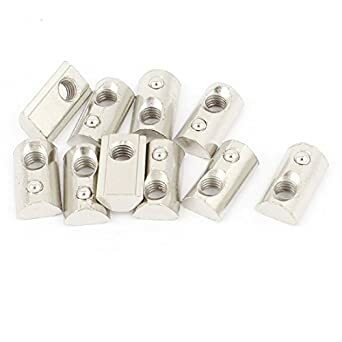 First, orienting a panel full of these nuts can be cumbersome, and second: drop-in T-nuts don’t always seat properly when tightened, leaving them catching nothing and utterly useless. In short, springloading the vanilla T-nut with our own springs is the cheapest bet for reliable assembly that guarantees that our nuts stay fixed during assembly, if you can sacrifice an hour to make the springs. Ok; enough with the chit-chat. Let’s start making springs! First, this stainless wire is fairly thin stuff. I’m sure you can substitute other wire types, but if you use anything thicker you must wear gloves. The wire I chose happens to be thin enough that it’s fairly friendly to form without the risk of drawing blood. Second, this stainless wire is also much harder than copper hookup wire. In fact, it’ll gladly nom your electronics wire cutters if you let them get too close to each other. I know it’s tempting, but make sure you use wire cutters that can handle hard wire, and, for heaven’s sake, don’t put this stuff anywhere near your teeth! Heads-up: plop on some eye-protection before marching into these instructions in real life! To prevent the wire from popping out of the drill chuck, we need to fatten up the tip. With pliers, curl away the end into a small lump like shown. From here, put a right-angle bend about 16mm (0.629in.) down the length. This bent piece will serve as our “key” for loading into the chuck. Now, unspool about 450mm (1.5ft) of wire and chop it off with your hard wire cutters. Now, let’s prep the tool. Load a small portion of your M6 threaded rod (or really long screw) into your hand drill’s chuck. Here I’m using a 40mm, M6 set screw with 5 threads-worth inserted in the chuck. If your drill has a low-speed mode, set it now. This next part is counter-intuitive: set your drill to the unscrew setting (aka: counterclockwise), which will make the wire climb the screw thread. From there, load the bent tip of the wire into the free space between the drill chuck teeth like shown. Slowly engage the drill trigger and let the wire collect on the screw. Rest your left-hand index finger on the wire such that it rests on a screw groove and slowly spool up the wire with the drill trigger. As it spools, keep your thumb away from resting directly on the wire. It’s tempting to rest our thumb on top of the wire and close to the screw, but it’s a pinch point. As you continue spooling do not spool up the whole wire length. It’s easy to lose control and have it whip your fingers. Larger wires would be sure to cut your hand, but this one would still leave a nasty sting. Instead, stop spooling with about 30mm (1.2in) of loose wire left. From there, remove your spooling hand, and the wire should uncoil itself with no pain to those precious fingers. Ta-daa! Your first spring has come to life. Note: Notice how our spring tends to expand after we finish winding it? I’ve tried a few different screw types and finally landed on M6, which leaves the spring expanding to a size that just perfectly fits over the bottom of a classic VSlot T-nut. At this point, our spring is a bit squished, so give it a stretch to give our spring about a 2mm pitch. I begrudgingly put a number on this step because I do this part by feel, and I’d encourage you to do the same. The stainless steel has such a weak spring constant that tolerances on this step are very forgiving. Finally, give that spring a haircut. With your hard wire cutters, cut down smaller springs that have about 3 wraps apiece. Again, tolerances in this step are also forgiving. If your spring has between 2.5 and 3.5 wraps, it’ll work. Remember: the whole idea behind these pieces is to save time later, not spend time now, right? All of these lengths work, so don’t sweat the tolerances! Finally, we’ve made it to that glorious moment! Load a spring on the back of your T-nut, slide it victoriously into position, and simply beam with exultation. And, perhaps, post to the internet. Tag appropriately. Call mom. This process may be a bit time-consuming, but I find it rather therapeutic when I’m supposed to be writing research papers. And for all the times where I have extrusions mounted vertically, these springs are a huge win. The same technique works for 1/4″ spring wire, but the spool of wire sits where the spool of wire wants to sit. Is there a point at which heat treatment starts to matter? A certain wire diameter? Or extension vs. compression springs? He is stress relieving, that is OK and as he says, might help with fatigue life etc. The heat-treatment I was talking about is hardening (heating red hot and quenching). That will not help the properties at all. I think that the cross-over between cold-drawn and heat-treated springs is at the point that cold-forming is just too difficult. Vehicle suspension springs (leaf and coil) for example seem to be hot-formed then heat treated. Spring-steel for heat-treatment is very different from music-wire, which is typically just a plain carbon (0.8%) steel. Be careful! A drill and thin gauge steel wire can cause serious injury in a heartbeat. Would be good to keep fingers far away from the wire while winding it, thin wire under tension next to a rotating rod is a recipe for slicing through flesh and having the bone wrapped to a spinning lathe followed by having the bone twisted off at the joint. Owie! If you have need to make a lot of these, here’s a modified method that will allow you to make significantly more in a shorter time frame. serious damage to you if it gets loose! I like the spring loaded ball versions better. the advantage is that the thread is longer so more force can be applied without stripping the thread (happened to me a few times) and they stay put in the slot while also staying together when you remove them. And you can drop them in the middle of the slot. A simpler, practical and free alternative is to use a small ball of adhesive rubber (the one used to attach postcards to the wall) to immobilize ordinary T-Slots nuts. It is easy to adjust the position of the nut, and to remove the adhesive rubber when it is no longer needed. In English it’s “Blu-Tack”. Dunno about other countries, just look up Blu-Tack and you’ll see the stuff. I’m sure we all knew what you meant though, the stuff to stick posters to walls. *British* English. In America, we hardly know anything about Blu-Tack, unless we happen to watch a lot of British TV. I have a question regarding the language in the first paragraph: What makes an aluminum extrusion open-source? I know 80/20 publishes their dimensions and there’s nothing different (to my knowledge) in the manufacturing of the aluminum sold by either company other than I would guess the “open” ones have lower quality raw materials. Is it just having “Open” or “Maker” in the name? I’m legitimately curious but I also have a pet peeve of people throwing around words like “Open”, “Maker”, etc. just because they’re trendy. It’s a past kickstarter that only leads to a defunct web page. Where some people slapped ‘open’ & ‘rail’ to describe anodized plates that let you put V wheels on normal T-track or Makerslide(tm) extrusions. It seems their initial site might have been replaced with an online store. They are open in that you could have a company that makes aluminum extrusions produce them for you. If you wanted to have a production run of OpenBeam or MakerBeam nothing is legal stopping you. It’s probably still better/cheaper to acquire OpenBeam and MakerBeam through their markets at this point for “economy of scale” and time, since any new producer would need to make or obtain the dies before starting production. I assume the 80/20 profiles are only available through 80/20 and its licensees, anybody producing 80/20 profiles outside of that would be subject to a lawsuit. I wonder if you could use a bit of foam to provide the necessary springiness? I have an 8-year old boy, which means I’m never more than 3 feet from a nerf bullet. perhaps a slice of nerf bullet foam would fit? If not, maybe rubber/pvc tube? Good idea. Foam ear-plugs ought to work too. >making the building process more manageable with less parts to track simultaneously. We just set and forget! But more generally, you can’t claim it is a mistake unless you claim to have never heard of it before; once you know people sometimes say it that way, you already know it is one of the meanings of the word. ;) It is how words work. Perhaps you are applying your own hypercorrection to what most people would find as completely acceptable grammar? I just use the regular drop-in type and small magnet to position it. Works great. I can even rotate it before attaching the screw.